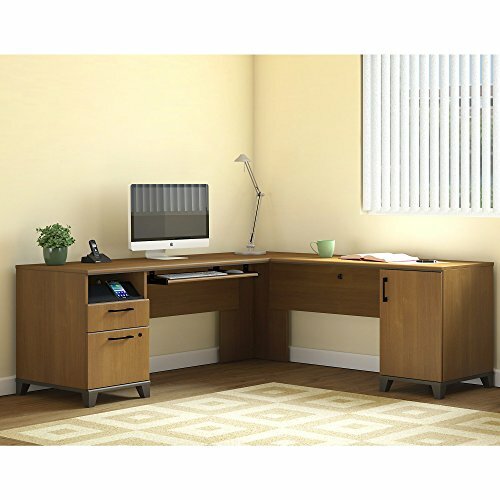 The Bush Furniture Achieve L Shaped Desk adds modern flair to your home office or small business. A large durable work surface includes an integrated wire management grommet and 4-port USB hub, allowing you to stay connected without the clutter of cords. Set up a keyboard or laptop on the convenient pullout tray. With office storage space on both sides of the L Shaped Desk, the left pedestal features a box drawer for supplies, locking file drawer and a soft shelf for electronic devices. Right pedestal offers a large closed storage area with an adjustable shelf for storing items of varying sizes. Contemporary and sophisticated, Achieve works well in any setting. Solidly constructed and Tested for wear and stain resistance, this quality furniture meets ANSI/SOHO standards for safety and performance. Backed by a Bush Furniture 6 Year Manufacturer's Warranty, Achieve features stylish tapered legs, and comes in Sweet Cherry with Brushed Nickel hardware, or Warm Oak with Black hardware. See the full collection for coordinating items available. American made with U.S. and imported parts.